By means of the IPL (Intense Pulsed Light) we concentrate great amount of energy on the hair follicle cells’ melanin, responsible for generating hair, removing it definitively. This process is denominated photothermolysis or selective photocoagulation, because it transforms the light energy emitted by the IPL equipment, into heat energy that destroys the dermal papillaes where the hair is generated, without injuring the surrounding skin. The procedure specific, scientifically proven and superior to everything else known up to date. By means of the last-generation equipment we work with, we can offer successful treatments in all the types of skin, still in tanned skins and/or with clear and fine hair. It constitutes a great solution for folliculitis (incarnated hair). The technique is non-invasive, doesn’t require needles, the use of wax, clamps or anesthesia. The treatment can be made to both genders, in all the areas and without age limitations. The effectiveness of the procedure will depend on skin color and hair thickness, color and growth state. Because the hair has different growth stages and Intense Pulsed Light removes the hair that is in growth phase (anagen), the treatment will require more than a session. Very few contraindications apply to the procedure. 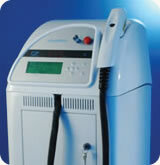 IPL hair removal is very effective, fast, safe and painless.